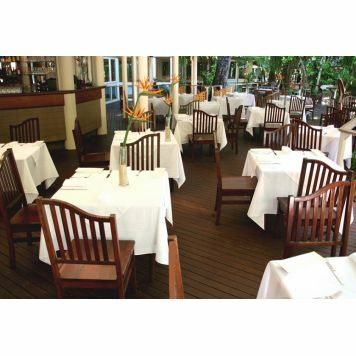 Located on beautiful Green Island, 27 km from Cairns, Green Island Resort is luxury on the Great Barrier Reef. 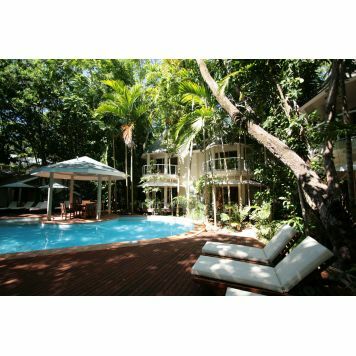 With just 46 airconditioned suites nestled amongst the rainforest and secluded from the day visitor facilities, this world-class eco-sensitive resort offers a unique blend of luxurious accommodation, first class service and unparalleled access to the Great Barrier Reef. Each suite features private balconies with either rainforest or pool views. 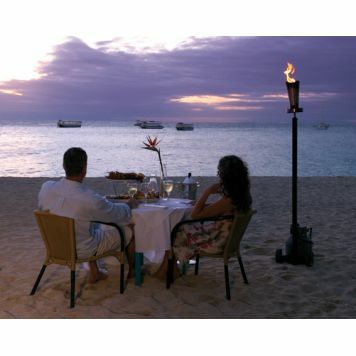 Guests can be pampered at the day spa, dive and snorkel the reef or simply relax on the beach or by the private pool. After a day of adventure or relaxation, indulge in dinner in the signature Emeralds Restaurant or even private beach dining. 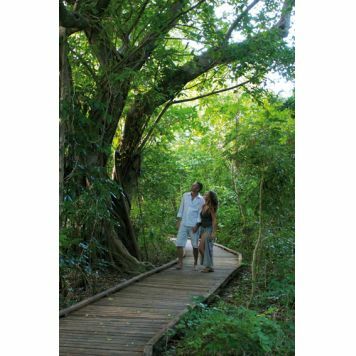 Green Island Resort is accredited with Advanced Ecotourism Certification. Price for 2 People. BONUS Buffet Breakfast daily. FREE catamaran transfers ex Cairns, sunset drinks, glass bottom boat tour, guided nature walks, fish feeding presentation, snorkelling equipment, kayaking, beach volleyball and windsurfing. 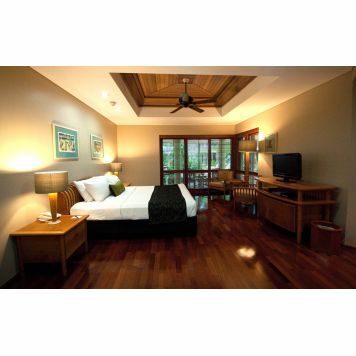 The Island Suite is a spacious guest room of 56 square metres, with King bed. 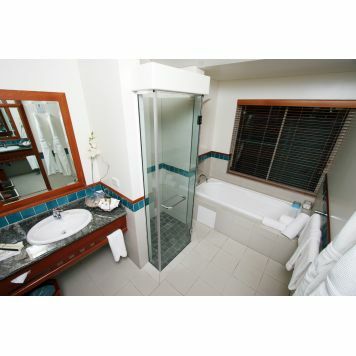 All rooms have separate bath and shower, and private balcony. Rollaway beds are available on request. In-room maximums 3 adults OR 2 adults & 2 children (Children 0-14years inclusive). Children under 14 years stay free in an Island Suite in existing bedding when sharing with two adults. Price for 2 People. BONUS Buffet Breakfast daily. FREE catamaran transfers ex Cairns, sunset drinks, glass bottom boat tour, guided nature walks, fish feeding presentation, snorkelling equipment, kayaking, beach volleyball and windsurfing. The Island Suite Twin is a spacious guest room of 56 square metres, featuring 2 x double beds. All rooms have separate bath and shower, and private balcony. In-room maximums 3 adults OR 2 adults & 2 children. (Children 0-14years inclusive). Children under 14 years stay free in an Island Suite in existing bedding when sharing with two adults. Minimum 2 night stay. Price is per person. The complete Great Barrier Reef holiday experience combines your stay at Green Island Resort with an exciting day cruise to the Outer Barrier Reef. Two nights Island Suite KING Room accommodation, Buffet breakfast daily, BONUS bottle of Australian Sparkling Wine on arrival, Great Barrier Reef Day Tour. FREE catamaran transfers ex Cairns, sunset drinks, glass bottom boat tour, guided nature walks, fish feeding presentation, snorkelling equipment, kayaking, beach volleyball and windsurfing. Your spacious Island Suite guest room of 56 square metres features a King bed, separate bath and shower, and private balcony. Price for 2 people. BONUS Buffet Breakfast daily. FREE catamaran transfers ex Cairns, sunset drinks, glass bottom boat tour, guided nature walks, fish feeding presentation, snorkelling equipment, kayaking, beach volleyball and windsurfing. 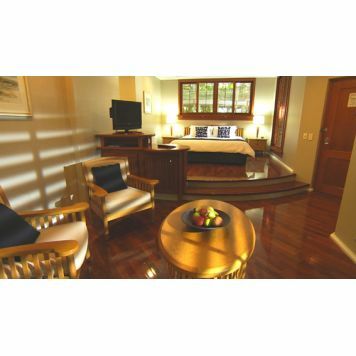 The Reef Suite is a spacious and luxurious split level guest room of 66 square metres. Features King size bed, spacious lounge area, separate bath and shower, and private balcony. In-room maximum is 2 adults. With a conference room for up to 40 guests in theatre style, Green Island Resort is an ideal retreat for small executive meetings, conference and incentive groups. For your catamaran transfers to Green Island, proceed to the Green Island Resort & Great Adventures check-in counter inside the Cairns Reef Fleet Terminal, located at 1 Spence St Cairns. Here you will receive your check-in pack and vessel boarding passes. Upon arrival to Green Island, you will be greeted by the Resort Staff and escorted to the Resort. Children under 14 years stay free in an Island Suite in existing bedding when sharing with two adults. Additional guest charge in an Island Suite is $99. Maximum capacity of Reef Suite is 2 people. Open and undercover car parking is available nearby the Cairns Reef Fleet Terminal at the Pier Marina Carpark. 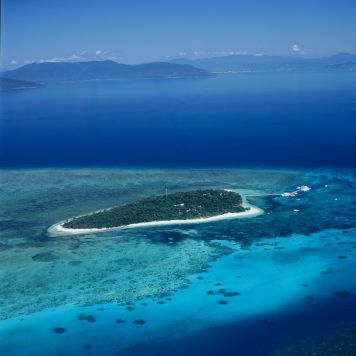 Return fast catamaran transfers from Cairns to Green Island are included in your room rates. Transfers take around 45 minutes each way. It is necessary for your transfers to be pre-booked to ensure seating availability and to confirm travel with you prior to arrival. When booking, you can choose from the following departure times. 0915/0945*, 1200, 1430 or 1630 (*Turnaround vessel subject to change). Helicopter and seaplane transfers are available, price on application. A variety of complimentary activities include sunset drinks, use of snorkelling and non-motorised beach equipment such as canoeing and windsurfing, rainforest and guided evening nature walks, glass bottom boat tours and daily fish feeding presentation. House guests can participate in a wide of range of optional island activities including Great Barrier Reef day tours, scuba diving (introductory and certified), boat snorkel trips, helmet diving and scenic helicopter flights. The island also has a crocodile habitat, Marineland Melanesia.